What's Extravagant Fruit, Like a Fifty Dollar Mango Look Like? Lots of things I saw in Japan were unique or exciting, but this was by far the most surprising. Those mangoes are definitely the prettiest I have ever seen and they certainly grabbed my eye while my nephew and I were shopping for snacks one night last week when we were in Hiroshima. The price tag warranted me taking a photo though. 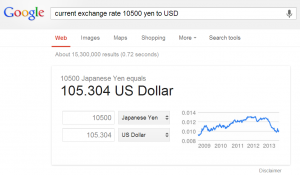 Since the exchange rate is right at 100 yen for every dollar, these two seemingly perfect mangoes cost $100 dollars. (I show the conversion at right just in case there is a skeptic among you. 🙂 ) I have been eating a lot healthier and one thing I have been spending more on is buying more fresh fruit and vegetables but I have to admit that $50 for a mango sounds like fairly extravagant fruit to me! In stead, I opted for some clementines and cherries! They were still more expensive than what I find in my neighborhood market, but they wouldn’t kill my budget for extras in one fell swoop! What was interesting is the reaction we got from Japanese friends when we’d mention it….. they would simply nod or perhaps say they must have been Japanese mangoes. So it was only shocking to the Americans! I posted a video compilation of photos from a visit to a Japanese grocery from earlier in our trip. No $50 mangoes there but I always find it interesting for see what stores have, what it costs, etc. What’s the most extravagant fruit or vegetable purchase you’ve ever made? Was it worth the price? While I passed on the mangoes that were $50 each, I will admit to having bought some somewhat extravagant fruit before. The most extravagant was probably dragonfruit. It was a few bucks for a single piece, which isn’t nearly as extravagant as the mangoes but was still outside the norm. That is crazy! Mangoes are my fave! I probably would have bought them. I’m imagining that they must taste amazing! The most expensive fruit I ever buy are Rainer cherries. They are so good, but can be pricey. It’s a splurge every time. And what are dragonfruit? It’s not something I’ve come across when buying local produce from the guy selling fruit from the back of his pickup. Nope, never saw them in the back of a truck in the Mid-South either. In fact, I hadn’t seen them til I went to Malaysia a few years ago. They originated in Vietnam according to a friend who grows them. You can see them on this post https://jploveslife.com/food/no-need-to-breathe-fire-cool-off-with-dragonfruit/ — now and then I have seen them for sale at Asian markets here in the US. I’m reading this a year after it was written but felt compelled to chime in. Those look to be packaged as “gifts,” which is a common part of Japanese culture. You will find a single PERFECT cantaloupe melon for over $100 in that section of a department store. Chances are you would have found a more reasonable mango at a regular grocery store. 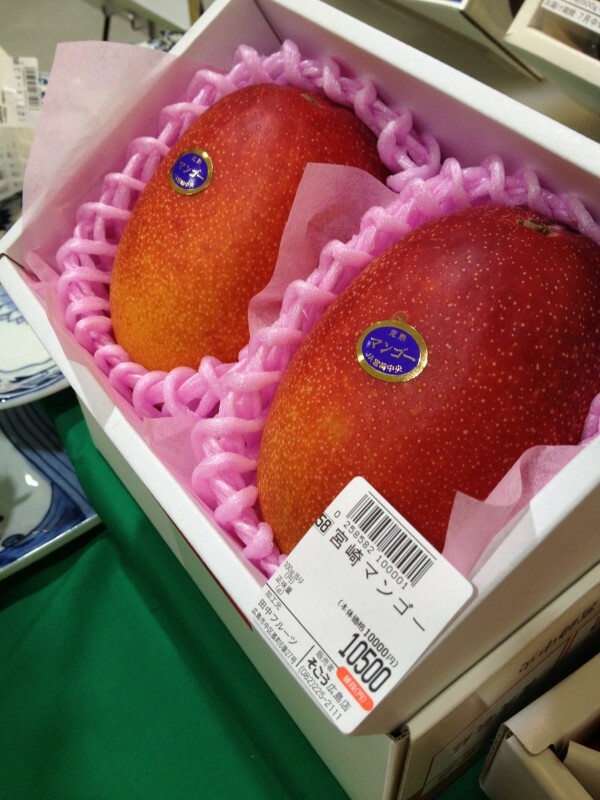 And, yes, according to the price tag, those are mangoes grown in Miyazaki. Yes Mindy, I know they are for the gift season, I spent a bit of time looking at all the various fruit gifts. So unique for Americans.